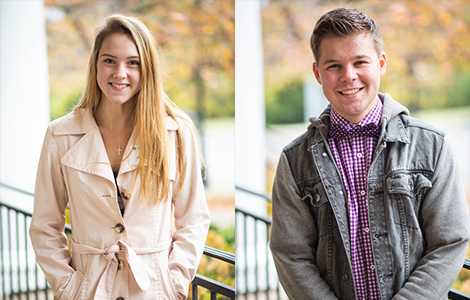 Sara Gruber and Wilson Vrieze are the most recent students to join the prestigious ranks of Trevecca Nazarene University’s McClurkan Scholars. Gruber and Vrieze are the 2019-2020 recipients of the McClurkan Scholarship, the University’s largest and most exclusive award. Named for Trevecca’s founder, J.O. McClurkan, the full-tuition scholarship is awarded to two incoming freshmen each year. To apply for scholarship, which began in 2007, students must have a minimum score of 29 on the ACT or 1330+ on the RSAT, combined with a minimum GPA of 3.5. Top applicants are then invited to campus to experience Trevecca’s campus life and participate in interviews, which took place in Nov. 2018. Gruber and Vrieze were chosen from among this exclusive group, with candidates hailing from 15 states and multiple countries. Both will receive full-tuition scholarships to the University. Gruber, from Gaithersburg, Md., played club and varsity volleyball throughout her high school career and participated in both track and field as well as lacrosse. Active on her Nazarene Youth International (NYI) council for the past four years at Gaithersburg Church of the Nazarene, she has also been an active member of her church’s worship band and is a volunteer for Best Buddies. Gruber plans to major in nursing at Trevecca. Vrieze hails from Cadillac, Mich. A gifted athlete, he has played both soccer and basketball for the past seven years. In addition, Vrieze has also taken an active role in student government throughout his high school career. He has honed his talents as a musician by participating in his high school choir and band in addition to leading worship as a member of Lake City Christian Church’s band. At Trevecca, Vrieze plans to major in commercial music. Being chosen as a McClurkan Scholar is an honor. The Trevecca community is excited to welcome Gruber and Vrieze to campus this fall. Trevecca Nazarene University is a Christian university in the heart of Nashville focused on preparing students for lives of leadership and service. Founded in 1901, Trevecca is committed to holistic education, encouraging students to grow intellectually, socially, emotionally, physically and spiritually. U.S. News & World Report ranked Trevecca as a national university in the annual “2019 America’s Guide to Colleges,” making the University the only Nazarene institution to receive the national ranking. In 2016, the Carnegie Foundation classified Trevecca as a doctoral university, ranking it among the top 7 percent of schools nationwide. Located just one mile from thriving downtown Nashville, Trevecca offers classes at the main campus as well as four other locations across the Southeast and online classes offered worldwide. With students from 47 states and 25 countries, Trevecca offers 15 associate degrees, 83 undergraduate majors, 20 master’s programs, and two doctoral programs, as well as specialist and certificate programs.